Some of this may relate to other art and design majors, but I’m focusing on illustration. I often talk with talented high school students considering studying art at college. My advice should be taken with a grain of salt. It took me 17 years to get my bachelor’s degree. During those wonder years I studied at all sorts of schools, metropolitan private art schools, rural state universities, and even an inner-city community college. 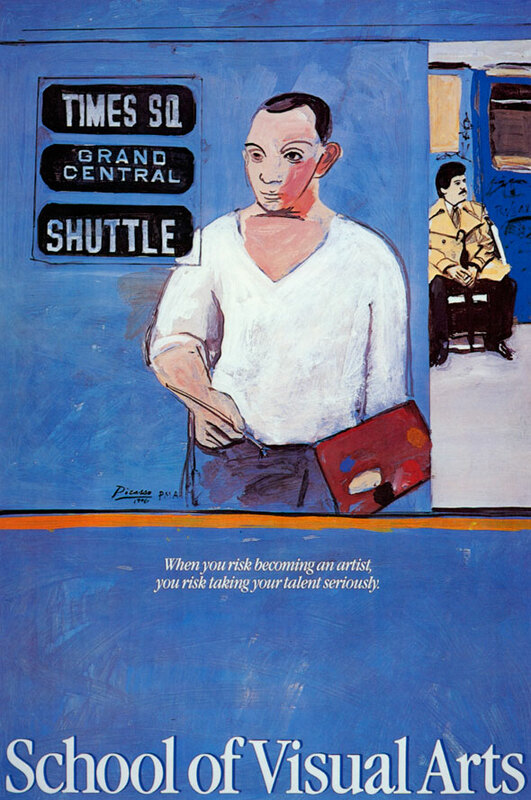 SVA poster by Robert Weaver, circa 1980. The first thing one has to learn is the difference between various sorts of art schools. There are state schools (Kutztown), state supported schools (Tyler), and private schools (University of the Arts, Phila.) and there are also many proprietary schools. A proprietary school is a for-profit college or university. Generally proprietary art schools that advertise on gaming sites, on FM radio, or those that offer a free laptop are to be avoided. The most dubious of these institutions are not accredited. Avoid any “college” or “institute” that has no accreditation. We’ve had students come to Kutztown after studying two years at a non-accredited art school who are near tears when they learn that zero credits transfer from their previous school. They might as well have not gone to college. In my opinion, a non-accredited school is the worst sort of place to study illustration. The U.S. Dept of Education has a web database where you can check to make sure a post-secondary school is accredited. Nearly as bad as unaccredited proprietary schools are small private liberal arts colleges known for general education. No good art school has a duck pond. These small liberal arts colleges are likely to be accredited by a regional body. They might have one talented teacher who teaches every art course from ceramics to lithography to 3-D modeling. Let’s suppose this prof has those requisite Renaissance Man/Woman qualities, imagine having a personality conflict with the only prof who teaches every course you need to study. Don’t go there. Proprietary schools are not necessarily scams. I got my graduate degree from SVA, The School of Visual Arts, in New York City. SVA was founded by Silas Rhodes and Burne Hogarth, who drew the comic Tarzan better than anyone. Originally SVA was founded as The Cartoonists and Illustrators School. Yowsa! I’m glad they changed that name; that wouldn’t look so good in Comic Sans on my diploma. In the beginning SVA catered to G.I. Bill veterans who wanted to live the artist’s life in Manhattan. Despite its, pardon the pun, sketchy origins, today SVA is fully accredited. It is also very pricey and a moneymaker for the Rhodes family. That said, if you can afford SVA, there are some advantages: Location, Location, Location, and the reputation of the faculty. Many of its teachers are giants in the field, Steven Heller, Marshall Arisman, Stefan Sagmeister, Jessica Abel, Paula Scher, Milton Glaser, to name a few past and present. I’m glad I went there. Let’s say you can’t afford the roughly $150,000 for a four-year SVA degree, but you live within commuting distance of NYC. For about $400, consider one of SVA’s one semester continuing education courses. For example, illustrator John Ruggeri teaches “Drawing New York City on Location.” He takes students on nightly sketch excursions to Chinatown, South Street Seaport, Night Court, and Grand Central Terminal. I didn’t pick that course at random. John was one on my gifted classmates and has earned SVA’s distinguished teacher award. His visual essays have appeared in leading magazines including The New York Times, Seventeen, Mademoiselle, Print, and Rolling Stone. It is possible to get a NYC art education for less than retail if one lives close enough. For example, a New Jersey resident might study full-time at Montclair State, a good art school in its own right, and take a continuing ed course in Manhattan each semester. Not just SVA, but Pratt, Parsons, and FIT all offer continuing ed bargains. Sometimes you end up in a class with regular undergrads. In some cases the course credits might transfer and count toward your degree; do your research. You might also be able to take a short workshop course at an artist’s studio. NYC’s Society of Illustrators occasionally has one night workshops with celebrated professionals. Greg Spalenka recently taught his intensive 3-day “Artist as Brand” seminar there for $295. This continuing ed principle can be used in other metropolitan areas. SAIC, The School of the Art Institute of Chicago, is another prestigious art school that offers continuing ed courses. You get to add a line on your resume underneath ‘BFA Graduate of East Bypass University –Studied at SAIC.’ If the faculty member is a star in your chosen field, you might put their name there, too. Next week I will post my thoughts about studying at state colleges and let you know the school in that category that impresses me most. That was an excellent article. I will print it up an give copies to my inner city community college students who ask me about these things. i look forward to the next installment. Thank you! Madeline, Thanks much for your comment. I once studied at Hudson County Community College in Jersey City. I wish your students well. They really appreciated the article. Thanks for writing. I think community colleges are great! I stumbled across your blog, and specifically this post, while researching graduate schools. I’m interested in going for an MFA in illustration. It seems like a lot of the big name schools want already established illustrators, not just recent grads… Do you think work experience over graduate degree is preferable in the current climate? You seem to be a wealth of info! I’m excited to read more of your blog. Thanks!